I had to shoot a photo of this casserole while it was still in the oven. I decided that if I brought it out and starting shooting photos someone might bite my arm. 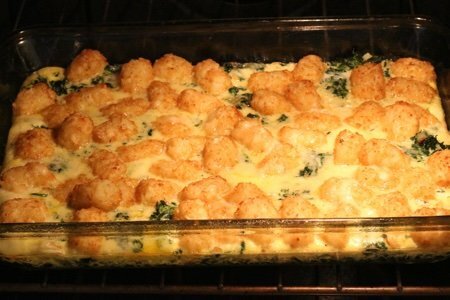 This is a casserole for those people who adore Tater Tots, are short on time, and want to eat breakfast all day long (blinner is breakfast, lunch, and dinner combined into one short word). One of my favorite diners serves breakfast all day long and I love it! I made it a bit healthier by dropping the sausage or bacon that usually makes its way into breakfast casserole and by adding chopped spinach. I also cut the amount of cheese as much as I could without losing the deliciousness. My kids went bananas (though they did complain about the green stuff) for this casserole. This recipe does not freeze well but it does keep in the fridge for a while. Do you have a favorite breakfast casserole? Please share. Preheat oven to 350 degrees. Spray a 13x9 baking dish with non-stick spray. Heat a frying pan to medium high and spray with non-stick spray. Saute onion until translucent and mix in spinach. Put into the bottom of the casserole dish and toss Tater Tots on top. In a medium bowl, whisk eggs and milk together and pour over Tater Tots. Top with grated cheese. Bake for 30 minutes or until the eggs set. A Grab And Go Breakfast from Snack Girl To The Rescue! Do you think you could use FRESH spinach instead of frozen or would it end up being too watery? Looks good Lisa, I think I will try it this week-end but add a little of the healthy Jimmy Dean sausage. 52% of calories from fat and 21% calories from saturated fat. I don't think this is that healthy. You might do better to use frozen grated potatoes with no fat added. As an alternative to spinach, I think broccoli would be good as well. I make an unhealthy version of this with biscuits, sausage and white gravy. So good, but so bad!!! My husband loves tater tots so I'm going to give this a try. @Julie - if you sauté the spinach with the onion at the start - you could use fresh spinach. I used frozen because it is less expensive. Thanks for your question!! How about frozen o'brien potatoes.. goodbye tater tots wherever you are! I love you snack girl but ..... This is not a good recipe ! Sorry !!! Tater tots ......no ! Curious - has anyone every substituted the frozen potatoes for the TaterTots in a recipe? do they soften similar to TaterTots? or? usually I make a TaterTot recipe for the husband so am cautious to substitute but I've often wondered (cuz even tho I make it for him I inevitably eat some too). Love this recipe, it looks fab in the your picture! Making this for the church crowd on Sunday! Love the added spinach - going with sauted fresh! Altho I did have TT's on occasion when kids were young, I wouldn't now, because I'd prefer to have their fall-back comfort food be healthier. I've gradually evolved to makeover all food concoctions with stuff I like individually, e.g. fresh produce over frozen, organic when available, etc. I started using thin sliced organic potatoes for a crust, overlapping in a scalloped edge and single layer on bottom, brushed w 1tbsp butter and pre-baked. Whip up eggs, milk, sauteed vegs, pour over baked crust, lay tomato slices over, scallions, sprinkle 1-2 tbsp grated cheese and bake til eggs set and potato edge browns. I'm sure lots of moms do similar remakes; very yummy and hopefully very nutritious starting off with fresh whole foods. That's what I do! Snack Girl, I know busy moms need these fast blinners and they are fun and easy but I'm just not going back to TT and froz spinach days. Here's a fast dinner I'm doing tonight because its still native tomato season. Thank you for putting the play in food! I somehow though tater tots were extinct. This will bring a smile to some faces I know....And a look of surprise!! I have made something similar for the last couple years but I use fat free O'Brien hash browns as the crust. Just spray 9x9 pan with Olive oil spray and use about 1_2 cups thawed hash browns and layer in bottom. Bake 400 degree preheated oven 30 minutes then decrease oven 350 and remove pan and add egg mixture. Bake 55 minutes. Would love to have your sausage, biscuits and white gravy recipe! I would NEVER use tator tots! I would, if I wanted potatoes, use potatoes. Not healthy. In my version I would skip the TT and add the highest quality bacon or sausage. I don't think this is a healthy recipe. Tater tots and cheddar? It's packed with cholesterol. You can substitute it better with sweet potatoes and almond cheese. I was just thinking how nice it would be to make the tater tot casserole I grew up with. As a vegetarian, and someone who also doesn't want to eat the standard American diet anymore, I just can't. Ground beef, cream of mushroom soup, and tater tots. Nope! BUT this looks like a really nice TREAT. I know people are getting upset because this isn't the single most healthy thing you've ever featured, but it's comfort food I'm familiar with, scaled down and with added nutrition. I don't think this is a bad recipe at all, and I like the option to have a healthier version of an old favorite!